f. Pilots should report to ATC the time and altitude/flight level at which the aircraft reaches the clearance limit and report leaving the clearance limit. NOTE− In the event of two-way communications failure, pilots are required to comply with 14 CFR Section 91.185. h. Patterns at the most generally used holding fixes are depicted (charted) on U.S. Government or commercially produced (meeting FAA requirements) Low or High Altitude Enroute, Area and STAR Charts. Pilots are expected to hold in the pattern depicted unless specifically advised otherwise by ATC. NOTE− Holding patterns that protect for a maximum holding airspeed other than the standard may be depicted by an icon, unless otherwise depicted. The icon is a standard holding pattern symbol (racetrack) with the airspeed restriction shown in the center. In other cases, the airspeed restriction will be depicted next to the standard holding pattern symbol. REFERENCE− AIM, Holding, Paragraph 5−3−8j2. 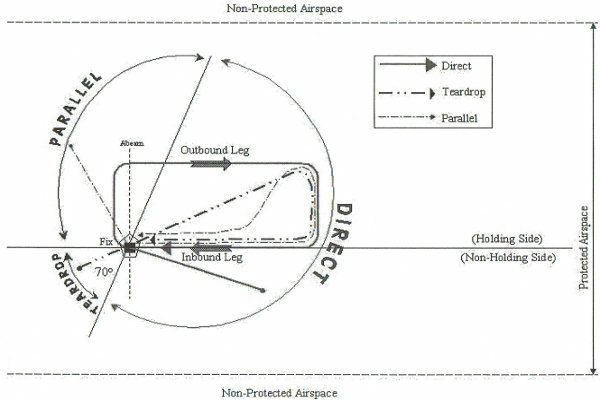 (d) While other entry procedures may enable the aircraft to enter the holding pattern and remain within protected airspace, the parallel, teardrop and direct entries are the procedures for entry and holding recommended by the FAA. NOTE− When the inbound course is toward the NAVAID, the fix distance is 10 NM, and the leg length is 5 NM, then the end of the outbound leg will be reached when the DME/ATD reads 15 NM. NOTE− When the inbound course is away from the NAVAID and the fix distance is 28 NM, and the leg length is 8 NM, then the end of the outbound leg will be reached when the DME/ATD reads 20 NM NOTE− The inbound course is always toward the waypoint and the ATD is zero at the waypoint. The end of the outbound leg of the holding pattern is reached when the ATD reads the specified distance. 7. Nonstandard Holding Pattern. Fix end and outbound end turns are made to the left. Entry procedures to a nonstandard pattern are oriented in relation to the 70 degree line on the holding side just as in the standard pattern. k. When holding at a fix and instructions are received specifying the time of departure from the fix, the pilot should adjust the aircraft’s flight path within the limits of the established holding pattern in order to leave the fix at the exact time specified. After departing the holding fix, normal speed is to be resumed with respect to other governing speed requirements, such as terminal area speed limits, specific ATC requests, etc. Where the fix is associated with an instrument approach and timed approaches are in effect, a procedure turn must not be executed unless the pilot advises ATC, since aircraft holding are expected to proceed inbound on final approach directly from the holding pattern when approach clearance is received. l. Radar surveillance of outer fix holding pattern airspace areas. 1. Whenever aircraft are holding at an outer fix, ATC will usually provide radar surveillance of the outer fix holding pattern airspace area, or any portion of it, if it is shown on the controller’s radar scope. 2. The controller will attempt to detect any holding aircraft that stray outside the holding pattern airspace area and will assist any detected aircraft to return to the assigned airspace area. NOTE− Many factors could prevent ATC from providing this additional service, such as workload, number of targets, precipitation, ground clutter, and radar system capability. These circumstances may make it unfeasible to maintain radar identification of aircraft to detect aircraft straying from the holding pattern. The provision of this service depends entirely upon whether controllers believe they are in a position to provide it and does not relieve a pilot of their responsibility to adhere to an accepted ATC clearance. 3. If an aircraft is established in a published holding pattern at an assigned altitude above the published minimum holding altitude and subsequently cleared for the approach, the pilot may descend to the published minimum holding altitude. The holding pattern would only be a segment of the IAP if it is published on the instrument procedure chart and is used in lieu of a procedure turn. m. For those holding patterns where there are no published minimum holding altitudes, the pilot, upon receiving an approach clearance, must maintain the last assigned altitude until leaving the holding pattern and established on the inbound course. Thereafter, the published minimum altitude of the route segment being flown will apply. It is expected that the pilot will be assigned a holding altitude that will permit a normal descent on the inbound course. (e) Advise ATC immediately what increased airspeed is necessary, if any, due to turbulence, icing, etc., or if unable to accomplish any part of the holding procedures. When such higher speeds become no longer necessary, operate according to the appropriate published holding speed and notify ATC. (d) Determine entry turn from aircraft heading upon arrival at the holding fix; +/−5 degrees in heading is considered to be within allowable good operating limits for determining entry. g. When holding at a VOR station, pilots should begin the turn to the outbound leg at the time of the first complete reversal of the to/from indicator. (b) Teardrop Procedure. When approaching the holding fix from anywhere in sector (b), the teardrop entry procedure would be to fly to the fix, turn outbound to a heading for a 30 degree teardrop entry within the pattern (on the holding side) for a period of one minute, then turn in the direction of the holding pattern to intercept the inbound holding course. (c) Compensate for wind effect primarily by drift correction on the inbound and outbound legs. When outbound, triple the inbound drift correction to avoid major turning adjustments; e.g., if correcting left by 8 degrees when inbound, correct right by 24 degrees when outbound. After departing the holding fix, normal speed is to be resumed with respect to other governing speed requirements, such as terminal area speed limits, specific ATC requests, etc.